It's officially fall in Michigan. The winds of change are in the air - and in the trees - and a new season of fun events are coming to launch us into October. Held on Saturdays and Sundays between September 29 and October 28, this is a fall tradition that should not be missed. The Coopersville & Marne Railway's train cars are almost 100 years old. They were built between 1919-1932 and are all decorated to celebrate the fall harvest. The Grand Pumpkin, Mr. Scarecrow and Boo-The-Cat will sing and tell jokes in your railcar during the 90-minute journey through family-owned farms and fields. At the end of the ride, all kids go to the track-side pumpkin patch to pick their very own, locally grown pumpkin. Working in the underground iron ore mines of Michigan's Upper Peninsula was a dangerous job. See the equipment - from rubber boots to hard hats and beyond - that protected miners from falling rocks, explosions and other dangers. Inside the Kalamazoo entrance, first floor. The Detroit Zoo’s annual “merry-not-scary” event has been re-imagined to bring even more Halloween excitement to your family! Zoo Boo will be held on the evenings of October 5-7, October 12-14 and October 19-21, between 5 and 8 p.m. on Fridays and Saturdays; Sunday hours are from 3 to 7 p.m. The Niles Scream Park is not just scary, it is considered by many to be one of the top haunted attractions in the country! Certainly one of the largest, the Niles Scream Park offers 44 acres of blood-curdling fear! Unlike other haunted houses, Niles rebuilds all seven major attractions each year to provide you with completely new and unique shows. The professionally designed sets and ingenious scare-tactics have led the Niles Scream Park to be recognized all around the country! Travel north with us to the Upper Peninsula and experience the beauty of Michigan in the fall. You'll spend the trip admiring the many colors of the season. We'll stop at Legs Inn, the National Shrine of Cross in the Woods and many more! You'll enjoy a 6 1/2 hour long train through a forest and riverboat tour to the Tahquamenon Falls. Two nights lodging and one lunch are included. Non-refundable $100 deposit. Seats are first come first served. This tour is $485 per person, includes a double occupancy hotel room. The corn has been cut for the 6th Annual M-60 Corn Maze and Pumpkin Patch in Union City, Michigan. This year’s maze is a farm theme with a turkey, barn and silo. Michigan's Largest Antique & Collectible Festival! 80 Acres of Treasures & Memories. The Michigan Antique Festival has been the Michigan's premier Antique & Collectible Festival for 50 years. October 6-7. Experience "Pure Michigan" by exploring the purity at a deeper level. This featured guided tour is limited to a small intimate group. Join us, bring your friends, and make new friends who love and appreciate Michigan's explosion of fall colors. 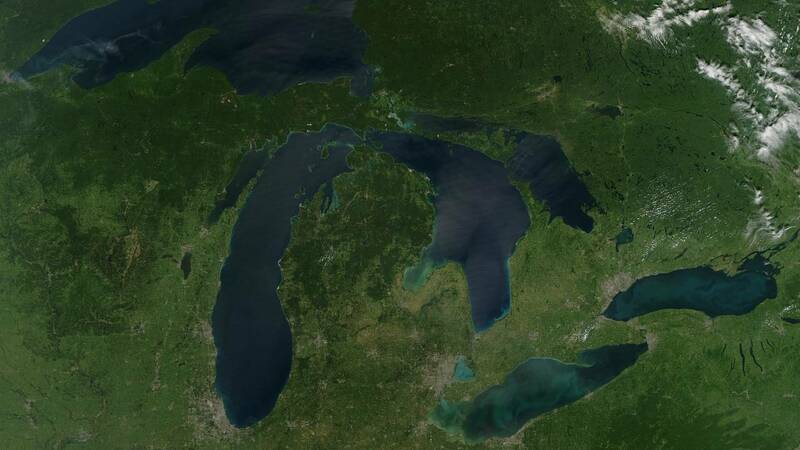 See Michigan's beauty up close and personal. Enjoy a quiet, safe and peaceful paddle. The Scarecrow Festival features a homemade scarecrow contest with scarecrows displayed in front of businesses, and homes throughout Oxford. Whether you are an autumn aficionado, appreciate great fall foods, or are just looking for something to do with the family, the Scarecrow Festival has something for everyone. The farm to table movement is as vital now as it was 300 years ago, and Fall Flavor Weekends in Greenfield Village showcases the abundance of the harvest season through stories and demonstrations. Disney On Ice presents Frozen visits Detroit from Thursday, October 18 to Sunday, October 21 for nine performances at Little Caesars Arena. ComiqueCon: Celebrating Women in Comics is a one-day festival celebrating the contributions of female comic creators taking place at the Arab American National Museum on Saturday, October 13, 2018. Red Wings will open their 2018-2019 season against the Columbus Blue Jackets on Oct. 4 at Little Caesars Arena. Pistons will open their 2018-2019 season against the Brooklyn Nets on Oct. 17 at Little Caesars Arena. Have you ever wondered what it's like to be an archeologist? Here’s your chance to discover surprising facts spanning 14,000 years of Michigan history and learn about the legendary Edmund Fitzgerald shipwreck in Lake Superior with author and photojournalist Chris Winters! Bring an artifact to show our experts! The Ford Amateur Astronomy Club will be bringing telescopes for public viewing of the night sky. Visitors are welcome to bring their own telescopes as well. Don't be a 'fraidy cat, celebrate Halloween with the Wheelhouse. We will visit a few spots rumored to be haunted, including the Fort-Shelby and Leland Hotels, Majestic Theatre and Masonic Temple. After more than half a century on the road and an unparalleled career that has redefined the cultural landscape and seen Elton John claim his place as a true global icon, the superstar recently announced via an exclusive VR180 live stream on YouTube, details of his final tour called ‘Farewell Yellow Brick Road’. Elton John will play at Little Caesars Arena on Oct. 12 and Oct. 13. Due to the success of the October 2017 concert, the Eagles – Don Henley, Joe Walsh & Timothy B. Schmit, with Vince Gill and Deacon Frey – have added a second (and final) “An Evening with the Eagles” concert at Little Caesars Arena on Sunday, October 14 at 8 p.m.
Foo Fighters’ “Concrete and Gold Tour” has added seven new headline dates to its North American itinerary including Little Caesars Arena on Monday, October 15 at 7:30 p.m. Legendary, Grammy-award winning band Fleetwood Mac announced today a North American tour, set to kick off in October and travel through more than 50 cities including a performance at Little Caesars Arena on Tuesday, October 30 at 8 p.m.